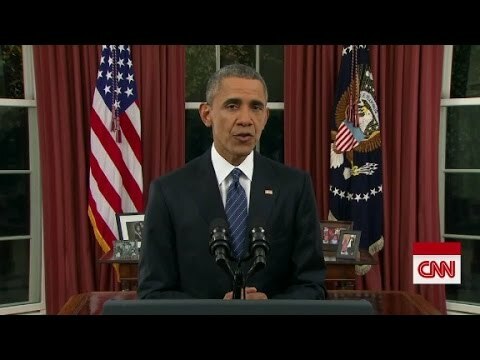 President Obama addressed the nation on Sunday night, in an attempt to calm the public mood after the San Bernardino killers were tied to Daesh (ISIS, ISIL) — though the connection seems to spring merely from common radicalism and murderousness rather than any organizational tie. Obama stood firm against the temptation to use the shootings at a facility to aid the challenged as a pretext for war abroad. One of Obama’s main points is that radical Muslim terrorist groups have had to evolve since September 11, since governments and industry have put in new safeguards that make big operations against significant infrastructural or security more difficult. As a result, such groups and individuals are now hitting “soft targets” to spread fear and panic. Whereas the 9/11 operation killed nearly 3,000 Americans and deeply harmed the travel industry, taking about 1% off economic growth for one year, more recent instances of Daesh or al-Qaeda violence in the US look more like lone wolf mass shootings than like guerrilla operations capable of doing any significant economic harm. Security procedures have made it much more difficult to inflict significant harm. Forestalling lone wolf attacks by persons unconnected to the terrorist group except as consumers of propaganda is almost impossible. But in turn, such attacks don’t do significant or lasting damage to the national economy, though of course they are traumatizing and a tragedy for the direct victims. Obama’s advice to the American public is to tough out these soft target attacks by sticking to our values and preserving our liberty, and by not being baited into big foreign military quagmires. Obama’s message is entirely plausible as a response. After all, the Right wing in the US has for decades has insisted that the right response to hundreds of mass shootings is to preserve their peculiar interpretation of the 2nd Amendment. Yet the same American Right, in the face of a small number of radical Muslim mass shootings, wants us to dump overboard the first, fourth and eighth amendments and the rights and liberties they guarantee us. Obama also warned against the corrosive influence of Islamophobia, and of establishing religious tests for refugees and for other purposes. Obama went beyond urging the public to just be steadfast in their commitment to liberty. He suggested a 4-point plan to roll up Daesh.